BOSTON, MA — A letter written by Bonnie Parker and Clyde Barrow to Raymond Hamilton, an ex-Barrow Gang member will be auctioned by Boston-based RR Auction. The purpose of this letter is to remind you of all the ‘dirty deals’ you have pulled. When I came to the farm after you I thought maybe the ‘joint’ had changed you from a boastful punk. Maybe you can talk yourself out of the ‘chair.’ Or maybe you can write a few more letters (try one to the governor) at least it will gain you some publicity. “Clyde Barrow wanted Raymond Hamilton dead and they wanted him to know it,” said Robert Livingston, Executive VP at RR Auction. “Brimming with remarkable content— this is a one-of-a-kind letter from the famed outlaw couple,” said Livingston. Bonnie and Clyde’s crime spree came to a bullet-riddled end in a shootout with Frank Hamer’s posse less than a month after the letter was written. Raymond Hamilton had joined the “ruthless Barrow gang” in the early 1930s and found himself incarcerated at the Eastham Prison Farm after taking the rap for a jewelry store murder. 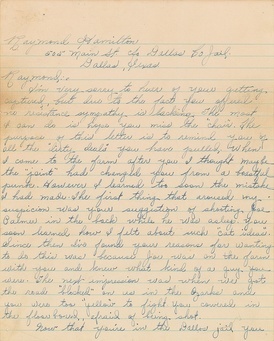 Clyde orchestrated a machine gun raid on the prison farm on January 16, 1934, freeing five convicts including Hamilton and Joe Palmer, as he mentions in this letter. A month later, the gang was seen stealing a car in Springfield, Missouri, and chased through the Ozarks, where they encountered a police blockade at Reeds Spring. Emptying their weapons on law enforcement, the outlaws successfully fled. Although Hamilton was reportedly involved in the gunplay, Bonnie and Clyde cite his alleged cowardice during the incident as a strike against him. On February 27, 1934, Barrow and Hamilton robbed the R. P. Henry & Sons Bank, in Lancaster, Texas, taking over $4,000. Between a disagreement over how the “loot” should be split and infighting about Hamilton’s companion Mary O’Dare—the so-called “Prostitute Sweetheart”—Hamilton angrily left the Barrow gang. Two pistols found on the bodies of famed Depression-era outlaws Bonnie Parker and Clyde Barrow after they were killed in 1934 sold at RR auction for a total of $504,000 in 2012. Lee Harvey Oswald’s ‘Fair Play for Cuba Committee’ card recovered by the Dallas Police. Online bidding for The Remarkable Rarities auction from RR Auction begins September 15 - 25, followed by a live auction that will take place on Monday, September 26, 2016 at 1PM, at The Royal Sonesta Boston, 40 Edwin Land Boulevard, Cambridge, MA. a preview is available online. For more information, please visit the RR Auction web site (www.rrauction.com).